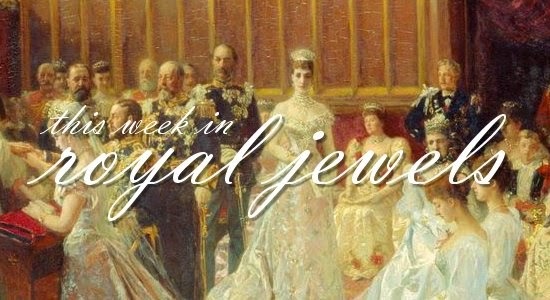 Lots of jewels to recap from the last two weeks! Here are ten of the best -- be sure to vote for your favorites in the poll! 10. Princess Anne wore a delicate pearl necklace and coordinating earrings at a Buckingham Palace engineering prize reception on October 26. 9. Queen Maxima donned multicolored pearl earrings at a conference about women's shelters in The Hague on Wednesday. 8. For an awards ceremony on Tuesday, Queen Letizia wore her Links of London Hope earrings. 7. The Duchess of Cornwall wore one of her signature pearl necklaces during a welcome ceremony in New Zealand on Wednesday. 6. At a dinner held by The Prince Albert II of Monaco Foundation on October 29, the Countess of Wessex wore a new pair of earrings and a gold necklace. 5. Queen Elizabeth II selected her Grima Ruby Brooch for Thursday's visit to Imjin Barracks. 4. As we discussed in depth in this post, the Duchess of Cambridge wore a pair of earrings from the collection of the late Queen Mother on October 27. 3. During a state visit to China last week, Queen Maxima wore lovely emerald jewels, including the family's large 18th century emerald pendant, with a gown inspired by the paintings of Van Gogh. She had to cut the visit short after she was diagnosed with a kidney infection, but she has since recovered. 2. Crown Princess Victoria wore the Baden Fringe Tiara (and a maternity evening gown previously worn by Princess Madeleine) on Wednesday at a state banquet for the president of Tunisia. 1. At the same state banquet, Queen Silvia wore one of the most glittering tiaras in the Swedish vault: the Leuchtenberg Sapphire Tiara.